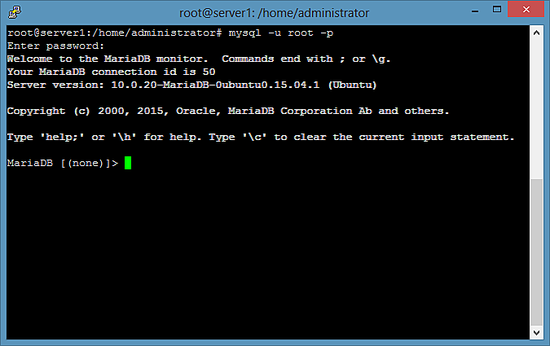 MySQL „show status“ FAQ: Can you demonstrate how to use the MySQL show statuscommand to show MySQL variables and status information, such as the number of open MySQL connections? I don’t have a whole lot of time today to give this a detailed discussion, but here is a quick look at some MySQL work that I did recently to show MySQL open database connections. All those rows and values that are printed out correspond to MySQL variables that you can look at. Notice that I use like 'Conn%'in the first example to show variables that look like „Connection“, then got a little wiser in my second MySQL show status query. LAMP is short for Linux, Apache, MySQL, PHP. This tutorial shows how you can install an Apache 2 web server on an Ubuntu 15.10 (Wiley Werewolf) server with PHP 5.6 (mod_php) and MySQL support. Additionally, I will install PHPMyAdmin to make MySQL administration easier. A LAMP setup is the perfect basis for CMS systems like Joomla, WordPress or Drupal. This tutorial shows the installation of an Ubuntu 15.10 (Wily Werewolf) web hosting server with Apache2, Postfix, Dovecot, Bind and PureFTPD to prepare it for the installation of ISPConfig 3. The resulting system will provide a Web, Mail, Mailinglist, DNS and FTP Server. ISPConfig 3 is a web hosting control panel that allows you to configure the following services through a web browser: Apache or nginx web server, Postfix mail server, Courier or Dovecot IMAP/POP3 server, MySQL, BIND or MyDNS nameserver, PureFTPd, SpamAssassin, ClamAV, and many more. This setup covers the installation of Apache (instead of Nginx), BIND (instead of MyDNS), and Dovecot (instead of Courier).